We have already described how in A.D. 628 the courts of Heraclius, of Kavadh, and of Tai-tsung were visited by Arab envoys sent from a certain Muhammad, «The Prophet of God», at the small trading town of Medina in Arabia. We must tell now whom this prophet was who had arisen among the nomads and traders of the Arabian Desert. 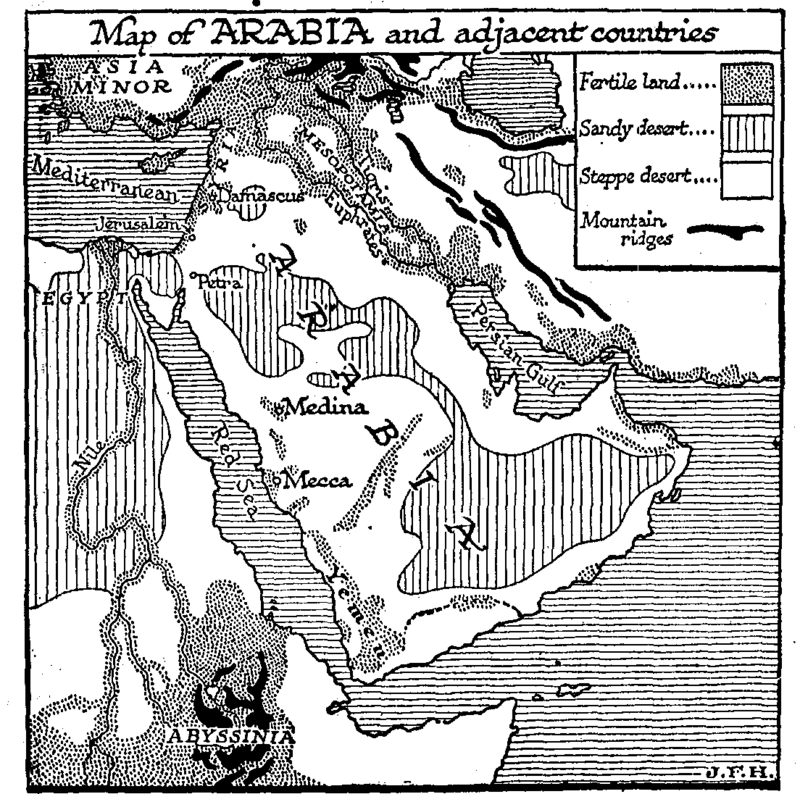 From time immemorial Arabia, except for the fertile strip of the Yemen to the south, had been a land of nomads, the headquarters and land of origin of the Semitic peoples. From Arabia at various times waves of these nomads had drifted north, east, and west into the early civilizations of Egypt, in Mediterranean coast, and Mesopotamia. We have noted in this history how the Sumerians were swamped and overcome by such Semitic waves, how the Semitic Phoenicians and Canaanites established themselves along the eastern shores of the Mediterranean, how the Babylonians and Assyrians were settled Semitic peoples, how the Hyksos conquered Egypt, how the Arameans established themselves in Syria with Damascus as their capital, and how the Hebrews partially conquered their «Promised Land». At some unknown date the Chaldeans drifted in from Eastern Arabia and settled in the old southern Sumerian lands. With each invasion first this and then that section of the Semitic peoples comes into history. But each of such swarming still leaves a tribal nucleus behind to supply fresh invasions in the future. The history of the more highly organized empires of the horse and iron period, the empires of roads and writing, shows Arabia thrust like a wedge between Egypt, Palestine, and the Euphrates-Tigris country, and still a reservoir of nomadic tribes who raid and trade and exact tribute for the immunity and protection of caravans. There are temporary and flimsy subjugations. Egypt, Persia, Macedonia, Rome, Syria, Constantinople, and again Persia claim some unreal suzerainty in turn over Arabia, profess some unsubstantial protection. Under Trajan there was a Roman province of «Arabia», which included the then fertile region of the Hauran and extended as far as Petra. Now and then some Arab chief and his trading city rises to temporary splendour. Such was that Odenathus of Palmyra, whose brief career we have noted and another such transitory desert city whose ruins still astonish the traveler was Baalbek. After the destruction of Palmyra, the desert Arabs began to be spoken of in the Roman and Persian records as Saracens. In the time of Chosroes II, Persia claimed a certain ascendancy over Arabia, and maintained officials and tax collectors in the Yemen. Before that time the Yemen had been under the rule of the Abyssinian Christians for some years, and before that for seven centuries it had had native princes professing, be it noted, the Jewish faith. Until the opening of the seventh century A.D. there were no signs of any unwanted or dangerous energy in the Arabian deserts, the life of the country was going on as it had gone on for long generations. Wherever there were fertile patches, wherever, that is, there was a spring or a well, a scanty agricultural population subsisted, living in walled towns because of the Bedouin who wandered with their sheep, cattle, and horses over the desert. Upon the main caravan routes the chief towns rose to a certain second-rate prosperity, and foremost among them were Medina and Mecca. In the beginning of the seventh century Medina was a town of about 15,000 inhabitants all told; Mecca may have had twenty or twenty-five thousand. Medina was a comparatively well-watered town, and possessed abundant date groves; its inhabitants were Yemenites, from the fertile land to the south. Mecca was a town of a different character, built about a spring of water with a bitter taste, and inhabited by recently settled Bedouin. Mecca was not merely nor primarily a trading centre; it was a place of pilgrimage. Among the Arab tribes there had long existed a sort of Amphictyony centering upon Mecca and certain other sanctuaries; there were months of truce to war and blood, feuds, and customs of protection and hospitality for the pilgrim. In addition there had grown up an Olympic element in these gatherings; the Arabs were discovering possibilities of beauty in their language, and there were recitations of war poetry and love songs. The sheiks of the tribes, under a «king of the poets», sat in judgment and awarded prizes; the prize songs were sung through all Arabia. The Kaaba, the sanctuary at Mecca, was of very ancient date. It was a small square temple of black stones, which had for its corner stone a meteorite. This meteorite was regarded as a god, and all the little tribal gods of Arabia were under his protection. The permanent inhabitants of Mecca were a tribe of Bedouin who had seized this temple and constituted themselves its guardians. To them there came in the months of truce a great in course of people, who marched about the Kaaba ceremonially, bowed themselves, and kissed the, stone, and also engaged in trade and poetical recitations. The Meccans profited much from these visitors. All of this is very reminiscent of the religious and political state of affairs in Greece fourteen centuries earlier. But the paganism of these more primitive Arabs was already being assailed from several directions. There had been a great proselytizing of Arabs during the period of the Maccabaeans and Herods in Judea; and, as we have already noted, the Yemen had been in succession under the rule of Jews (Arab proselytes to Judaism, i.e. ), Christians, and Zoroastrians. It is evident that there must have been plenty of religious discussion during the pilgrimage fairs at Mecca and the like centres. Naturally enough Mecca was a stronghold of the old pagan cult, which gave it its importance and prosperity; Medina, on the other hand, had Jewish proclivities, and there were Jewish settlements near by. It was inevitable that Mecca and Medina should be in a state of rivalry and bickering feud.